It was a great chance for them to move Bruce in a positive direction but they'd rather keep sad and broken. A shame really. Yes, it would have been nice for Tom King and DC to take a chance at portraying a happy marriage for Batman and Catwoman, instead of the two pining after each other from afar, like it has been for the past 30 years. Say what you will about Brian Michael Bendis but at least he is doing something new and original for Superman and his family, even if it seems that he is testing their familial strength and mutual bonds. It looks as if the DC higher-ups are thinking "how many sad and depressing Batman stories we can get away with until the fans eventually get tired?" It angers me her ongoing is a success, as that convinces DC that the decision was a just one. I remember being excited for the prospect of the Bat Bride having an ongoing separate from Bruce if she were married, that could easily have conveyed the themes of "modern marriage" (which is what Bendis is trying to do with Lois and Clark, only Lois has no ongoing as we speak presently), with husband and wife not needing to be around either consistently to have adventures and command some agency. Bendis aside, DC can't seem to understand how non-conventional relationships work. I blame it Dan Didio and his stupid hit list. There's speculation Didio could be made redundant later in the year, here's hoping. 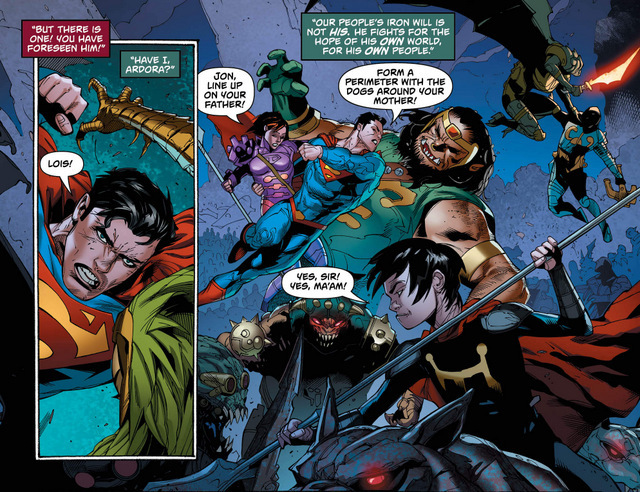 I really do believe (or hope maybe) that Didio has softened on the Superman/Lois relationship. His most recent comments on comic marriage were really in the context of Batman and to a certain extent I actually agree with him on marriage being the end of Batman's story in a way. Clark and Lois are really in a completely different category and their stories have traditionally had a much different tone, especially in movies and television. Like I said earlier, Batman is a character that they have always had a tacked on love interest in his movies, but the story of Superman (in it's most successful mass market variations) is in very large part a romance at its core. I really do believe (or hope maybe) that Didio has softened on the Superman/Lois relationship. His most recent comments on comic marriage were really in the context of Batman and to a certain extent I actually agree with him on marriage being the end of Batman's story in a way. Bruce would have someone healing his wounds in Selina, but I don't think he'd give up on the mission. That annual King wrote established the Bat-Family were very much still committed to it. With the DC shake ups happening in the last week or so, I would hate for anyone to lose their jobs. I don't need DiDio gone, It would be far better for him to adapt to the times and stop holding on to the past, stagnated ideas. There's obviously room for these characters to explore their single-hood but that should be in mini format that focuses on a specific period of their journey that cannot be covered in current continuity. We can have both as long as it actually builds towards something. These characters are 80 years old, they cant be stuck in reboot mode every half decade just to keep them young. It's oddly not sustainable. I feel like they shied away from Bruce and Selina because it still gives them an out, not so much with Lois and Clark. They did away with the marriage once, it won't be so easy the second time, especially with other mediums readily embracing the more mature versions of the characters that are now happily settled in themselves. People are attracted to that because it shows that these beloved characters can grow along side them and there's no shame in that. I still love the idea of young Clois and won't refuse it when they give it to me but I really love that they got their happily ever after, with a son they love and adore and want to see their new adventures, charting new territory, something we were cruelly denied in the 90s when they cancelled LNC. This is why I think Superman deserves another blockbuster movie, preferably with Henry Cavill and Amy Adams in the leading roles, and barring that, a TV show that delivers a proper a balance between epic, larger-than-life action and grounded, realistic romance. Clark/Lois is the emotional core and the most human element of the Superman mythos and exploring that relationship is always fun. I'll take a movie, plus a new show, and a solo book for Lois thank you. Last edited by adrikito; 02-09-2019 at 01:47 PM.